If you've been waiting impatiently for Google Chrome on Linux, there is now a developer version available for Ubuntu and Debian systems (x86 and x86-64-bit only). The first step to installing it is to go to Dev Channel on chromium.org and download the appropriate .deb package file for your architecture. You'll have to accept a license agreement before you can begin your download. Once the install completes, it can be found on Ubuntu's menu under Applications→Internet→Google Chrome. One of the nice features of the .deb installer is that it automatically adds the Google Repository to your sources list. In my experience, Chrome gets updated at least once a week. Since it's still a developer version, it's a good idea to leave this repository enabled so that you benefit from the frequent updates. I installed Chrome on my desktop computer running Ubuntu Hardy Heron (8.04) a few weeks ago. In order to get the Flash plugin to work I had to manually create a plugins directory in the Chrome installation and create a symbolic link to the Adobe Flash binary installed on my system. Even after doing that I had some trouble getting Flash content to work. It seems that Chrome had detected the Flash plugin that is part of my Crossover Office installation and I couldn't get it to recognize the native Linux plugin. A later update of Chrome fixed the issue. 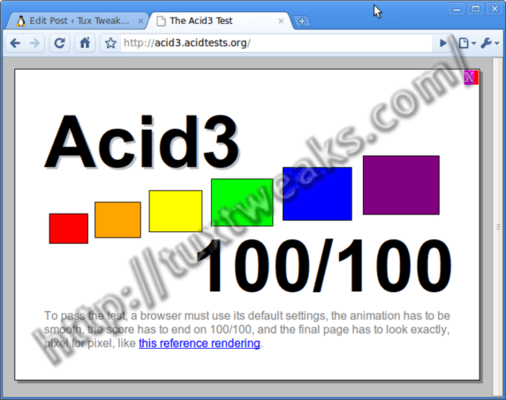 As of this writing, Chrome nearly passes the Acid3 browser test. The small X in the upper right corner of the window is the only deviation from the reference rendering. The development version of Chrome on Linux has been working pretty well so far. It certainly seems snappier than Firefox; especially when authoring blog posts in WordPress. I experience a bit of lag between keyboard input and output to the screen with Firefox (even when using WordPress' Google Gadgets based Turbo mode.) I experience no such lag when using Chrome. On the negative side: Chrome on Linux looks just like Chrome on Windows. The window decorations, buttons, scroll bars, etc. do not follow the selected theme of the desktop environment. Although this isn't a huge issue, it would be nice for the look and feel to be consistent with the rest of my applications. Google is so far reluctant to move Chrome from developer status to beta status, but based on my experience, Chrome is certainly usable and reasonably stable for general web browsing use.